The world is a dangerous place which is why you should be prepared for anything that might come your way. You may not need an entire bugout bunker but having a survival kit in your car can’t hurt. 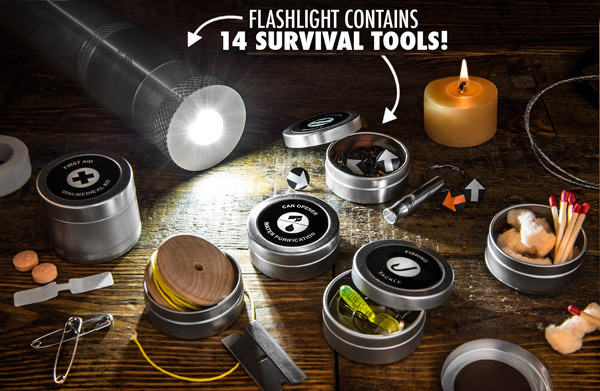 The VSSL Survival Kit + Flashlight is a compact kit to help you make it through the woods. By “through the woods” we mean whatever emergency situation you may find yourself in. You probably won’t find yourself fighting off wolves but you may have to hike a few miles in the dark to a gas station. In any case, this little kit has a variety of supplies to get you there, all in an easy carry kit. The weather resistant aluminum case holds not only a LED flashlight but also a compass, trail markers, a candle, razor blade, water purification tablets, a wire saw, rope, a first aid kit, waterproof matches, fire starters, fishing gear and a signaling mirror. Even if you don’t ever use ANY of that, it’s still a flashlight! Perfect for storing anywhere really. The VSSL Survival Kit + Flashlight is $98.50.